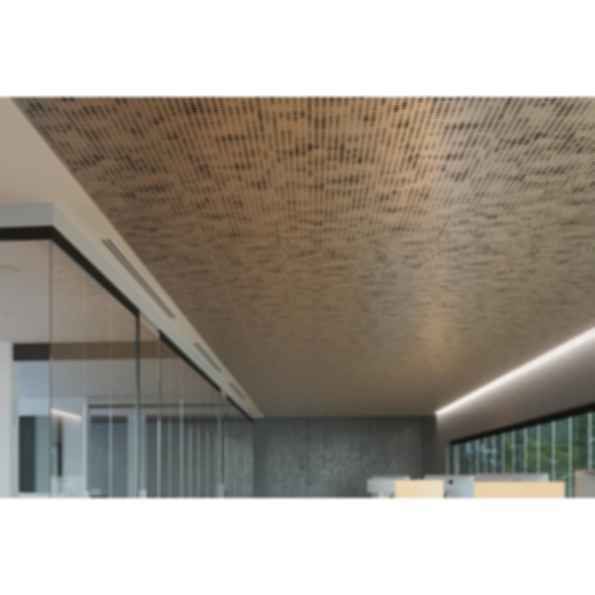 Vapor® ceiling systems offer a variety of complex patterns generated from simple, repeated elements. The panels are compatible with industry standard grid systems and their scrim-like design functionality allows HVAC, lighting elements and other infrastructure to be shrouded yet fully operational. Optional backing materials can be added — our frosted polycarbonate transmits light from above, and Soft Sound®, an acoustically performative material developed by Arktura, is available in a variety of colors and finishes. At Arktura, we make design happen. Creativity, expert knowledge and cutting-edge technology shape everything we do—whether it's exploring form and function in our furniture range, adapting our preconfigured architectural systems to meet project needs, or partnering with clients through our Solutions Studio. Our multidisciplinary team brings together architects, designers, programmers, engineers and artists with a deep understanding of the creative process. We use our collective ingenuity to bridge the gaps between design intent and manufacturing capabilities, creating proprietary software and adapting machinery to meet evolving demands.